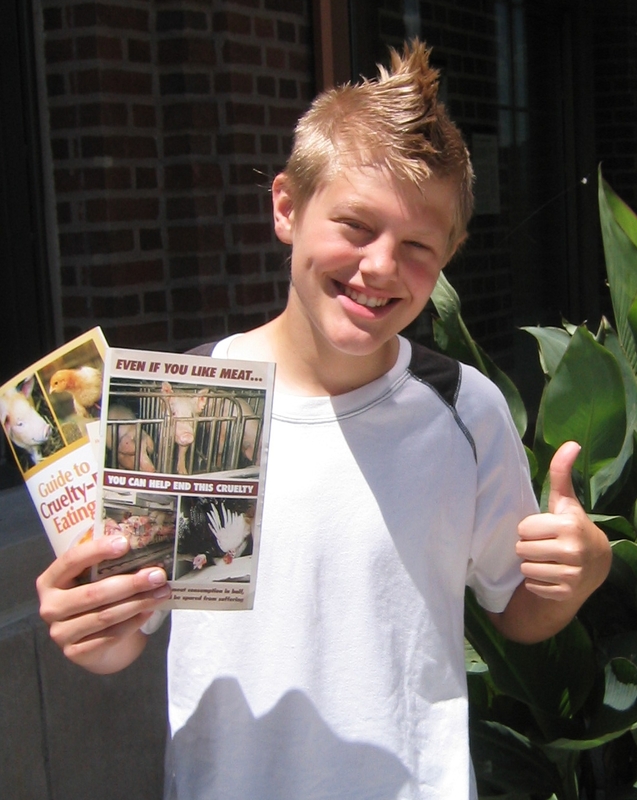 Distributing leaflets about factory farming and vegetarianism is one of the most effective forms of animal activism in terms of time spent, resources used, and results. Rather than feeling pressure or judgment, recipients of leaflets can review the information on their own time and draw their own conclusions. This results in a true and sustainable change. It is not uncommon to pass out hundreds of leaflets in just one hour depending on the location. Simple calculations show that with the average American consuming about 35 birds and mammals each year (not to mention dozens of aquatic animals), a move to a vegetarian or vegan diet can save hundreds or even thousands of animals over just one person’s lifetime! This represents a serious victory. CAA provides volunteers with free Vegan Outreach leaflets to distribute at local concerts, civic events and college campuses. Over the course of the past few years we have continued our educational outreach by directly handing out hundreds of thousands brochures on vegetarian eating, mainly to youth—the most receptive demographic—at dozens of different schools and hundreds of concerts throughout Minnesota. We have leafleted all over the Twin Cities and beyond, including at parades and outdoor festivals such as May Day and the Warped Tour. We also regularly leaflet concerts and other events where large numbers of people gather. CAA carefully chooses the most effective, accurate, and honest literature to raise awareness of the conditions farm animals face and ways we can help make a difference. At a concert last month I was handed an “Even if You Like Meat” brochure. At first, I disregarded it and threw it in my backpack. That evening, when I got home, I found the brochure and sat down to take a look at it. I was so shocked by what I saw and read that I had to call my boyfriend right away to tell him about it. We both decided then that we would become vegetarians and do what we could to help get rid of the horrible practices of factory farms. Although it was a tough change, we both feel it is the right thing to do. We have been strict vegetarians since and are on our way to a completely vegan lifestyle. Now that I have been enlightened, knowing what I know, I could never go back. On my first day at University of Minnesota, Twin Cities I received a pamphlet about the cruelty that happens to animals in the meat industry. After viewing the pictures and reading the heart-breaking stories, I am no longer going to eat meat. It has now only been 3 days, but I have been meat-free and feel great. I’m interested in helping any way I can. I was given a brochure “Why Vegan” last Saturday when my daughter and I attended a walk for a local Humane Society, and after reading it, I was faced with no choice but to turn to a Vegan lifestyle. I simply could not do anything else. I am horrified that I was kept in the dark about this for so many years. When I was hanging out with an old high school buddy the other night, he was telling me that his 14 year old brother was at the University of Minnesota, Twin Cities the other day for some reason and received some info from “some vegan guy.” In any case, apparently after reading the information (probably a “Why Vegan?”) he has committed himself to going vegetarian. Simple things like leafleting are extremely important and do have a real effect like in this case. Even when people do not immediately go vegetarian or vegan, we are still planting seeds–they may be thinking about animal issues and their diet more often or discuss it with their friends/family after receiving literature.